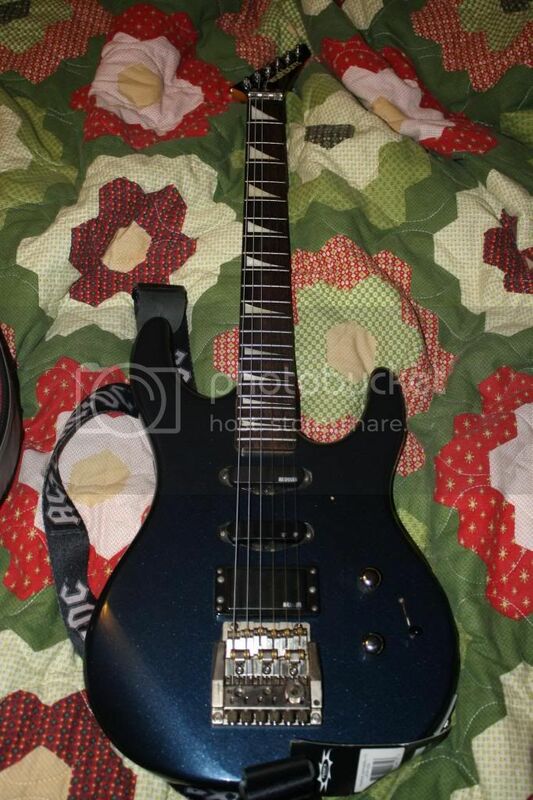 I purchased a Washburn G5V for my son for a Christmas present and NOBODY at any guitar place knows anything about this guitar. I am not finding any info on line about it, and wonder if you can tell me details about this guitar. Where do I get a whammy bar for it, is the bridge a Floyd Rose, please tell me all you know about this guitar. It would be greatly appreciated, now this is my mission before I give it to him for Christmas! Thank you so much, and If you need a pic, I will send you one. I figure it is a 85-86 guitar, and it is blue. Welcome. serial number and pic would help a lot. Tom. The number is 6060223 and I will try to attach a picture of it for you. Thank you so much! Well your 6 fits with your number. the first one or two numbers is your year. and we no it is not a 1960. lol. one step closer. Tom. yep I just did a search and it says your guitar started in 85, so you were rite. serch is rite above, lots of hits. Tom. I am still trying to figure out how to attach a picture! Sorry! Thanks for all your help. Do you think that it is worth anything, or will be at any time? Photobucket.com is free and simple to use. post a pic there click on img link it will turn yellow for a .5 second, then come back here and click reply then click paste in the reply box, and close the box and your pic is here. or at least that is for windows,others should be about the same.Don't think it will be worth !000000 but it has value, and if your buying it for your kid it will be priceless. If nothing else it looks cool. Tom. Thanks, I will try photo bucket. And yes, it will be priceless to my son because he really likes the 80's heavy metal bands, just like his momma! The guitar is known as a heavy metal guitar of the 80's! I will go try to upload the pic right now. Thanks for all your help! If you could find any more info about it, I would appreciate it. I bought a new whammy bar for it, and it isn't the exact fit, and wonder where I could buy parts for it from. Okay, I am not sure that this worked? I don't see my picture in the last post, it just says image something. I will try again! Okay, here you go. Hopefully you can see it now. Thanks! There ya go now we all no what your talking about. Tom.